Hornets are wasps of the genus vespa, a close relative of the yellow jacket. There are over 20 species of hornets in the world, but the most common is the European hornet. Hornets average 1.25-3.5 cm in length, however they can reach up to 5.5 cm. Hornets often have a yellow-stripped pattern but can also have a mixture of black, brown, red and gold. Hornets mainly inhabit heavily wooded areas, meadows and forests. When introduced into residential areas, hornets build nests under decking, roof eaves and in construction gaps. Hornets build nests similar to wasps. The nests are constructed of paper, a byproduct from the wood and debris they digest. As the colony grows, the hornets enlarge the nest for their new offspring. Hornets nourish themselves with nectar and other sugar-rich plant foods. They prefer honeydew and tree sap but will also feed on insects. 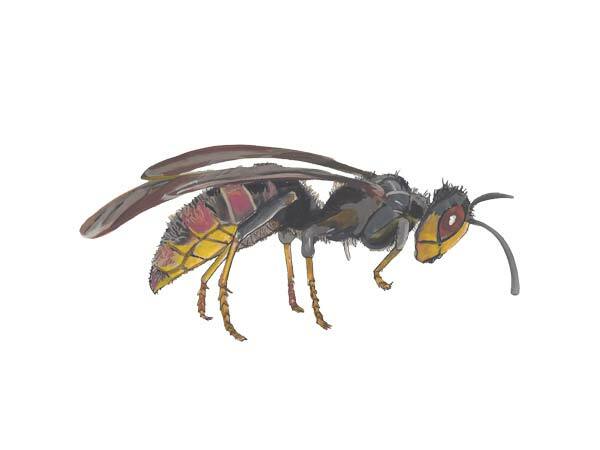 Hornets use their poisonous stingers to hunt bees, grasshoppers, flies and other insects. Fertile females or queens create their nests in the Spring. They select an area that is protected from the elements, usually inside a tree or under a roof eave. Eggs are laid into tiny cells inside the nest and hatch within 5-8 days. The queen feeds the young with protein rich foods such as flies, grasshoppers and other insects. When the first generation matures, they take over the queens duties such as tending to the young, defending the colony and maintaining the nest. The nest starts out small with around 50 cells and gradually increases as the colony grows in size. Protect your body, face and eyes. Cover up with long pants and a long sleeve shirt. Use goggles and a scarf to protect the face. Gloves are also important as well as thick socks and boots. Use a long reaching aerosol foam pesticide to treat the nest. Make sure not to stand on ladders, a common mistake when treating nests. Keep children and others away, for the pesticide may drift once applied. Dispose of the hornets and the nest once the treatment is complete. Make sure all of the hornets have been eradicated before removing the nest. Dont live with hornets threatening your family. Call us today for a free hornet inspection. We serve Sarasota hornet control, Bradenton hornet control and surrounding areas.